Top 13 finalists of American Idol will perform songs by Whitney Houston and Stevie Wonder on next week’s milestone 400th episode. Season 11’s finalists were announced on last night episode following two nights of live performances from the Top 13 boys and Top 12 girls who made it to the semi-final. Ten contestants were voted through to the next stage by the American public, while judges Jennifer Lopez, Steven Tyler and Randy Jackson chose three more acts as their wildcard picks. Fox has now confirmed that the Top 13 will perform tracks by Whitney Houston and Stevie Wonder on Wednesday, March 7. The female contestants will take on the Whitney Houston’s songs, while the men will tackle the Stevie Wonder tracks. Mary J. Blige will mentor all contestants throughout the week. Whitney Houston passed away at the age of 48 at the Beverly Hilton Hotel in Los Angeles on Saturday, February 11. 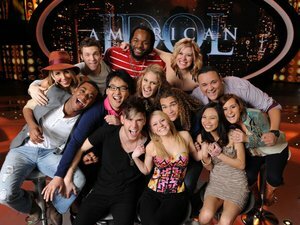 The Top 13 contestants are: Hollie Cavanagh, Colton Dixon, Heejun Han, Jermaine Jones, Skylar Laine, Joshua Ledet, Shannon Magraine, Phillip Phillips, Jessica Sanchez, Elise Testone, Erika Van Pelt, Jeremy Rosado and DeAndre Brackensick.